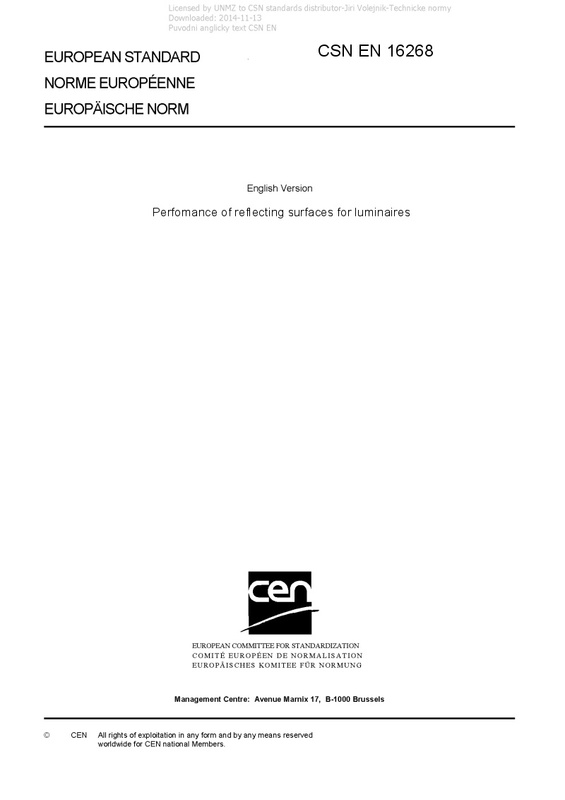 EN 16268 Perfomance of reflecting surfaces for luminaires - This European standard is applicable to the optical performance of untreated or coated materials supplied in plane sheet or strip form for use as a plane or formed reflector as well as preformed reflectors both as originally produced and after prescribed tests to determine probable maintained performance in service. This includes: a) untreated base materials, including: 1) aluminium, 2) steel, 3) plastic, 4) glass. b) surface treated materials, including: 1) polished materials, 2) anodised materials, 3) vacuum metallised materials, 4) painted materials, 5) multilayer systems. This European Standard is not applicable to fluorescent materials.